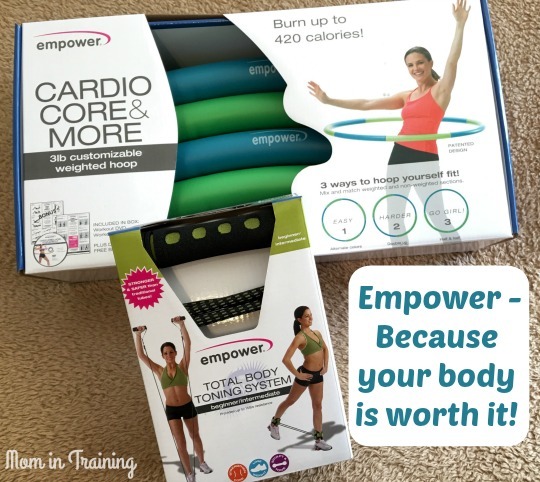 Stacy Tilton Reviews: Empower - Because your body is worth it! Empower - Because your body is worth it! If you have been following me long you know about a year and a half ago (beginning of 2015) I was on the Nutrisystem program and did very well with it. Lost weight and felt great. But like many others once the program was over I fell back into old habits and didn't keep the weight off. Fast forward to now and I'm giving it another go. But this time I'm going at it a totally different way. What I like to call the natural way. I'm not going to spend my time getting wrapped up in quick fixes so to speak, I'm going to go about it with goals of looking and feeling better for the long haul. One of the ways I'm doing that is through at home exercise. Yes I could go to a gym, and I actually did try out a personal trainer even. It was great to hear some useful information, but I left there feeling more discouraged than encouraged. I mean who would feel motivated when someone pushes you so hard you're in physical pain for several days after? And that's why I'm giving it a shot at home using Empower Fitness products. That and it's something I can do anytime of day without having to hop in my car and travel to town. The two products I've started out with from them are the Cardio Core & More Weighted Hoop and the Deluxe Total Body Toning System. One thing right off I liked about these products is that they aren't over-sized so they don't take up much room. I can pull them out and use them, then put them back in my "exercise box" I made out of the way. You can even break down the hoop if you don't want to leave it together all of the time. Another thing I like is that they offer you workout guides so you're not left holding the product wondering "now what?". I don't know how many times I walked into the gym just staring at the big weight machines wondering how I was even supposed to use them. With these I have a print out that shows me photos as well as detailed explanations on how to use them in various ways. The hoop even came with a workout DVD, now that's what I'm talking about! Plus on the Empower website they have a whole section of just workout videos you can check out for inspiration too. Who says you can't gym at home? I haven't been at it too long yet because life is just now finally starting to slow down, but I feel confident this is the right path for me to go. Now to continue to fill my "exercise box" other useful exercise tools to keep me motivated and trying new things.